On March 7th, the Moon will be traveling through the sign Scorpio, its sign of debilitation. Likewise Mars, who is the Ruler of Scorpio, will also be in debilitation in the sign of Cancer, the Ruler of the Moon. In Vedic Astrology, this forms a yoga called Neecha Banga Raja Yoga (the cancellation of debilitation). This yoga is created when on March 7th both these planets interchange their signs. It is like you trading houses with your landlord; he lives in your house, and you live in his house for a while. The two planets provide a level of support to each other. (Mars is the landlord of Scorpio, Moon is the landlord of Cancer: Mars moves into the Moon’s house Cancer, and Moon moves into Mars’ house Scorpio). What makes this an even more rare occurrence is that this occurs during the 8th Moon Phase when the Moon transits the 8th sign of the Natural Zodiac. Eight is a powerful number for transformation and change. Both Mars and Moon will be on earth plane bringing down the energy of the Goddess Chandi, the Moon Goddess, and Skanda aka Lord Muruga (overlord of Mars). Goddess Chandi is a fierce goddess who responds immediately to the prayers of her devotees. 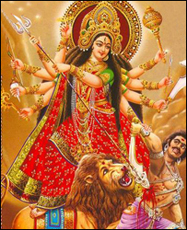 She is a combination of Goddess Durga and Goddess Kali, and has 18 arms bearing weapons to destroy evil. AstroVed is offering a Tantric Chandi Homa at the Dattatriya Siva Baba Temple during this rare planetary occurrence. The benefits of performing this Chandi Homa include – attainment of success and strength, and removal of fears, ailments, danger, and defeat at the hand of adversaries. Goddess Chandi vanquishes and annihilates the two demons – Shumbha (pride) and Nishumbha (shame), and the negativities of indulgence and denial, thereby reestablishing balance. The core of the ceremony is an elaborate ritual involving 9 priests initiated into Goddess Empowerment. These priests invoke, over the course of 3 hours, a recitation of the Durga Saptashati or 700 powerful and secret verses in the praise of Goddess Durga. With the recitation of each verse, offerings are made in the sacrificial fire invoking the Goddess. Later in the week, on March 11th, Mars goes direct (forward from being in retrograde), but he will still be debilitated. The Moon will be traversing the sign Capricorn on this day making it a second unique time that Mars has its debilitation cancelled — this time because Mars (in Cancer) will be exactly 180 degrees from the Moon (the Ruler of Mars). The Moon’s gentle direct gaze at its own sign of Cancer while Mars is present in Cancer will bring balance to the fiery planet. The planet Mars will be empowered at this time; this is equal to it being exalted. On this day, Mars gives powerful blessings. Also, the Moon will be aligned with the star Shravana; since this is a star ruled by the Moon itself, the placement again is very powerful for the Moon. This will happen during 12th Moon Phase which the famous saint, minister, astronomer and diplomat Vishnu Gupta (popularly known as “Chanakya”) had termed as a ‘good thithi’ (phase of the Moon). Everyone can benefit from remedies for the Mars positioning at this time – especially those born in Aries and Scorpio, and those with the birthstars of Mrigashira, Chitra and Dhanishta (all ruled by Mars and Lord Muruga). To help prepare for the influence of this time, you could fast on Tuesday (the day ruled by Mars) and wear red (the color favored by both Mars as well as Lord Muruga). AstroVed is offering a special ‘Skanda’ or Muruga pooja at the Dattatriya Siva Baba Temple, where Lord Muruga will be bathed in a mixture of Kum Kum (sacred red powder) and milk. This is a sacred Tantric ritual with the milk mixture symbolizing blood, which Mars governs in our bodies.